Long Live Open Front Float Tubes! * Safe and Easy to get in and out of verses round tubes. * Less resistance means easier to move then round tubes. * Lighter to pack, quieter to fish and the best bang for your buck over Pontoon Boats. "The ultimate open front float tube"
Every thing about this tube says "Ultimate". From it's large size to the 600 denier nylon shell. It's the boat to float. It will handle 300lbs and still keep you safe. The seat design keeps you higher then most tubes on the market. Why? Just lean back and get a gush of water down your back in other brands and you'll appreciate that feature alone. One way Boston valves make inflating and deflating a breeze. It comes with fly patches and back pack straps, N/C. If anything, like you loosing a valve cap happens, we will replace it for free and we'll pay the shipping. Your safety and complete customer satisfaction is guaranteed. 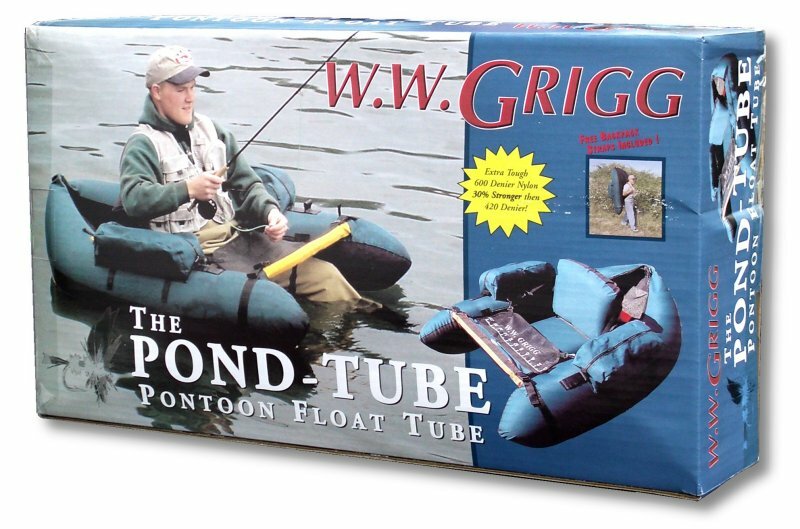 The Pond-Tube / Pontoon style float tube. The Pond-Tube sets itself apart from conventional open front tubes. This tube uses two seperate bladders and incorporates an inflatable seat. By sitting up higher, it's the ideal tube for covering lots of water.